What is it? – Go Home Ball is a physics-based action-puzzle game that tasks you with helping a little red ball get to the exit across a wide assortment of interactive Rube Goldberg-like levels. Who made it? – The game was developed by the Sigma Studio Team. How does it play? 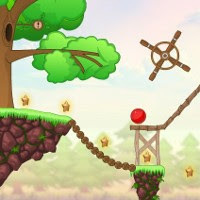 – There are quite a few games based on the premise of constructing a contraption to achieve a certain objective (Compulse and Collider, for example). Go Home Ball turns this formula on its head, requiring you to build parts of your machine in real-time to accomplish your goals. You’ll need to collect all of the stars by making your ball collide with them, before reaching the exit. Once a level begins, you’ll have three tool-types at your disposal. Branches can bridge gaps, spring loaded platforms give your ball extra lift, and a hand icon can be used to nudge the ball left and right. Branches and the springy platforms will only remain for a couple of seconds, making your timing as critical as placement. Presentation – From the tranquil forests to icy mountaintops, the game is visually pleasing. The background music is also soothing. Physics also play a large roll, and thankfully, they’re well implemented. Positives – Building a route for your ball while it tumbles toward the exit is a very fun (if occasionally frantic) experience. All of the levels are also very well designed, and there aren’t many instances where you’ll have a problem finishing a level once you figure out what to do. There are 24 levels in all, and you’ll probably be left wanting more. Negatives – The difficulty progression seems a bit hit-or-miss. You’ll probably run into a level that gives you some issues, and then subsequently blow through the next few without much trouble. Why you should play it – Go Home Ball is a well-crafted and fun game that adds a unique twist to the machine-building genre of strategy games by adding some great real-time action elements. It’s also one of the few games with a title that you might find yourself yelling at your screen during some of its trickier puzzles. All in all, fun stuff!